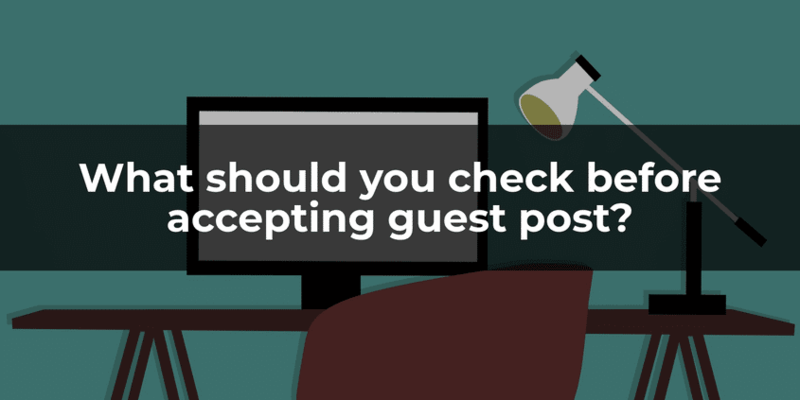 What should you check before accepting guest post? Do you want to allow others to submit a guest post on your blog? Accepting guest posting is another marketing tactic for blogging. You can easily get lots of content on your blog by accepting guest posting. So you can realize how it can help you to become more successful in blogging. But, wait. There are many things you have to check before accepting guest post on your blog. You can’t just approve any post submitted by a guest author. So what should you check before accepting guest posting? What are the key metrics that you have to follow? Here in this post, I am going to tell you some of the important metrics that you have to check before accepting guest post. These are very important for you if you would also like to allow guest posts on your blog. Suppose, an author has submitted a post as a guest blogger on your blog. Now should you publish it or not? Before you check the quality and content length, first you should check if the content posted by a guest blogger is duplicate or original. Or simply check for plagiarism. If the content is duplicate, taken from any other website or blog post then it will ruin your blog. Search engines like Google don’t like plagiarized content. Duplicate content may negatively impact the rank of your site. Does you will lose organic traffic. Google is now so smart that it can understand if your content is duplicate or not. So you must have to care for this. But how can you check if the content is original or not? Well, there are some online tools available to check the uniqueness of the content. Currently, I like to use this online plagiarism checker tool to check if the content is original or not. In many times, guest bloggers use images which they get just by searching on Google without checking the copyright of the images. Well, this is not right. As the owner of the blog, you can inform your guest bloggers to use original images or tell them about some of the free stock images like Pixels, Pixababy, Unsplash and many more. To check if the image has the rights to use, you can search by image on Google. Another important thing you must have to check if the guest blog post is related to the niche of your blog or not. Suppose, you have a blog which has the technology niche. Obviously, you don’t want a blog post related to fashion. So you must have to accept only those blog posts which are related to your niche. I hope, you already know that a blog having a particular niche rank better on search engines than that of the multiple niches. Content quality is one of the most important factors which determine the quality of your blog. Content quality is another factor of Google algorithm. So before you publish the post, you must have to read the post completely and check if the post has the quality to be on your blog. With the same point of view, you should not publish posts having low quality, less informative and which can decrease the user readability. Low quality of readability, lots of spelling and grammatical mistakes can spoil your blog. If these mistakes are few, then as an editor or owner of the blog, you can modify or edit to solve these mistakes and then publish it. But, if the number of these mistakes are huge in a post and it will take lots of your time, then it is better not to give time in solving these. It is better not to publish these posts and give the time creating new posts and improving your blog. It is often found that guest bloggers are submitting posts to promote their service or product. Well, some bloggers put these types of the post under paid review or sponsored post. If self-promotion adds value to the article and readers then you can publish these posts. But sometimes people go overboard with it in guest posts, and this is not good for your blog. So you should manage these types of blog posts carefully. Chck if promoted product or service is really good and helpful to your readewrs. If the guest post contains one or more external links, then it is better to check those links and see the domain authority. Also, try to determine the authority of the links. If those links are not authorized and not valuable, then it is better to think about it twice. If you think those link as not much trusted, then you can contact the author and talk about it. On the other hand, if you find the links from authority sites and add value to your audience then it will improve the quality and trust of your blog. So, in that case, you should publish the post if all the other factors are qualified for the guest blog post. So I have discussed what should you check before accepting guest post. I hope you have got the idea and will keep in mind before publishing a guest post.